Everyone has a bad day, tempers often flair and it is easy to strike out when your facing your opponent through a computer screen. The bad news is that a review whipped out in anger can live on the Internet for a long time. I am on their mailing list and have been a customer for more than 20 years. I have only good things to say about them, both from the standpoint of customer service and the quality of the tools they sell. So when I received this letter, I was only too happy to cast my vote. When I did, it was around noon and there were less than 10 total reviews. When I checked about 5 hours later the number had grown to over 300. Every one I read was 4 or 5 star review and completely burring the bad review. I think there are a couple of things that here that are of note, first the letter from the owner explains in a frank way what had happened. Second, he invites others to leave a review based on their experience. 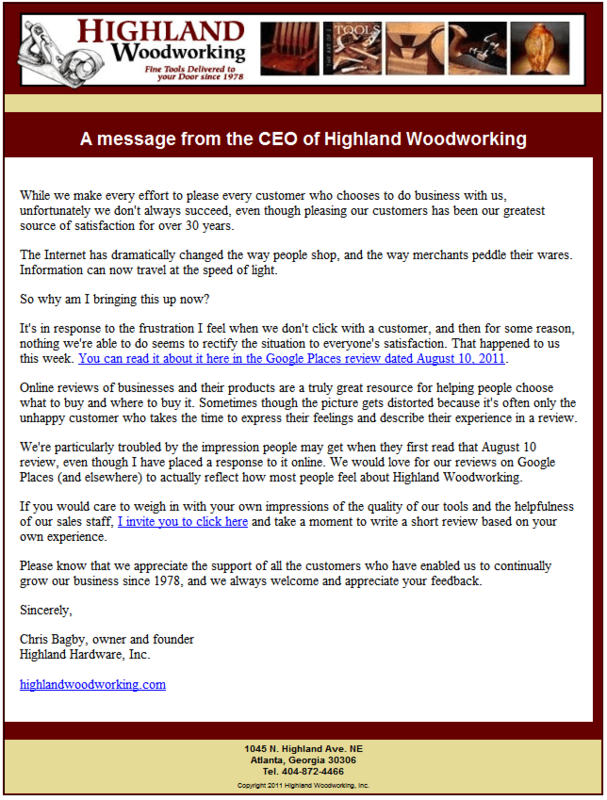 It is clear from the response that Highland Hardware has a track record among its customers of good service and products that its customers were happy to share. Letter reprinted with permission from Chris Bagby.